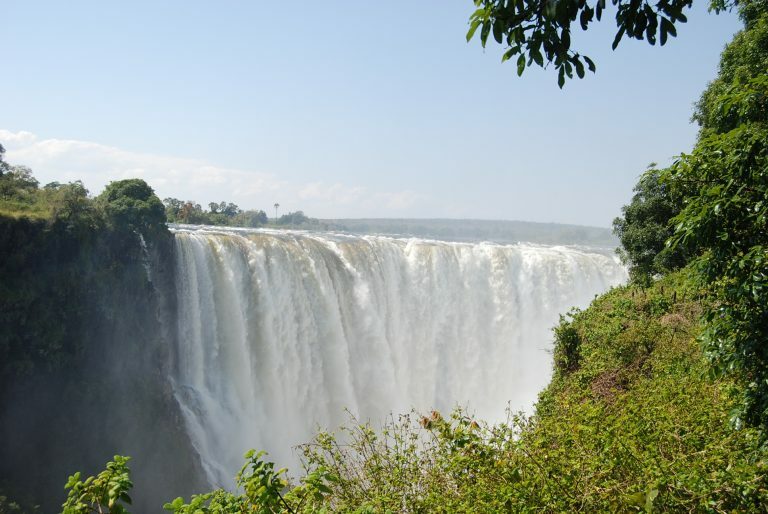 Though the “curtain” side of the falls is technically on the Zambia side of the Batoka Gorge, you can view the majority of its width (approximately 2/3 of the way across) via the viewpoints in Victoria Falls National Park in Zimbabwe. Several kilometers of trails wind their way along the cliffs that overlook the gorge, allowing you to sneak peeks of Devil’s Cataract, Cataract Island, the Main Falls, Livingstone Island, Horseshoe Falls, and Rainbow Falls. In peak flow season (from April-June) the parts near the center (Main Falls and Horseshoe) are so thick with mist that it’s hard to see anything, but during the rest of the year viewing is much clearer. The walking trails in Mosi-oa-Tunya National Park (US$10 to enter) permit views of the spectacular Eastern Cataract, which is not easily visible from the Zimbabwe side. One of the highlights of the Zam side is Knife Edge Bridge, which stretches across a sub-gorge in the park, and results in a good soaking when you cross it during peak flow season. 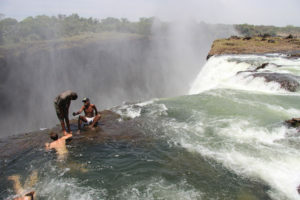 From from mid-August to mid-January, when the water level in the Zambezi is low, it is possible to walk along a small section at the top of the falls (on the Zambia side) and access the pool that forms there. A rock lips forms a natural barrier that prevents swimmers from being swept over. There are guides present who supervise swimmers and make sure no one does anything too risky. Also on the Zambian side is a trail that leads down 110m (360 feet) to the roiling whirlpool where the water ends up after it flows over the edge. Once you get to the bottom you can take a boat to the area directly below the curtain. This is one of the only ways to see the falls from the bottom of the gorge. However, it is a strenuous hike, strewn with rocks, and not for the unfit or small children. There are a half-dozen companies that offer “flightseeing” trips over the falls, for about US$160 per person. (I went with Batoka Sky.) The shortest ride takes about 15 minutes, though you can opt for a longer and pricier trip if you want. Bring your camera gear and prepare for some truly mind-blowing views. For the more daring there are flights in microlight aircraft, which is sort of like a hang glider with a small propeller on the back. The pilot sits in front and the passenger in back. The cost is about US$150 for 15 minutes. 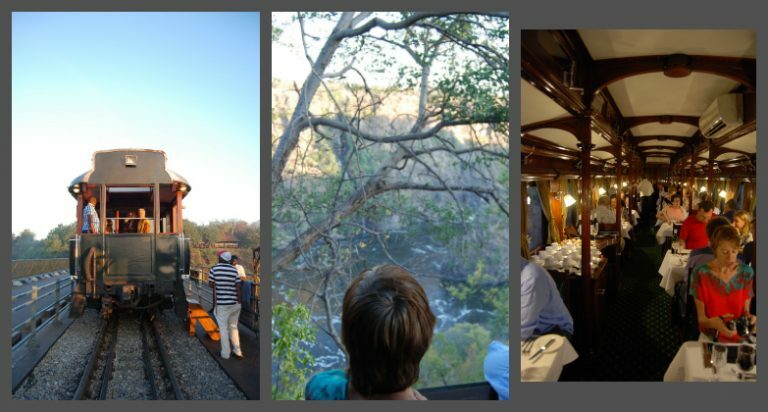 The Royal Livingstone Express is a refurbished luxury train that runs from its depot in Livingstone, Zambia to the center of the Victoria Falls Bridge. It lingers there until the sun sets, allowing for great photo ops. Then it heads back to town while a five-course dinner is served. The whole experience takes about three hours and admittedly doesn’t allow you to have a full-immersion falls experience, but it sure is fun and the food is fantastic. There are various tour companies that offer tours and dinner cruises on the part of the Zambezi that flows above the falls. Though you can’t see the curtain of water, in peak flow season you can see the massive plume of mist that rises above the gorge. And if you’re a guest at the Royal Livingstone Hotel, you can opt to arrive by boat, as shown in the video above. What a stupendous way to arrive!